Welcome to my home! May you have the best vacation ever! A private, heated, secluded pool! A float, a book, a drink—aah!! 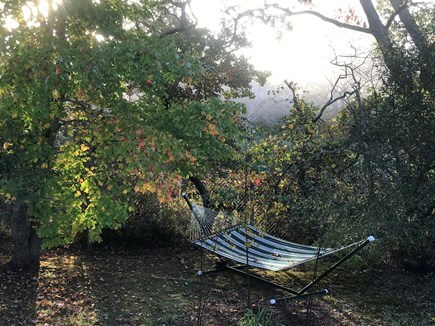 Read a book, take a nap...the hammock welcomes all! Dining room...in case you might want to eat indoors for a change! Large, well equipped kitchen designed for those who love to cook! 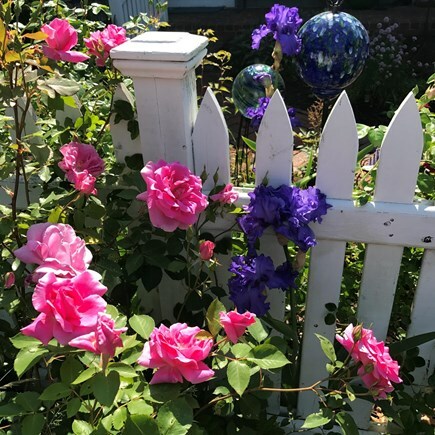 Roses love Summer on Cape Cod! Please cut some for your table! 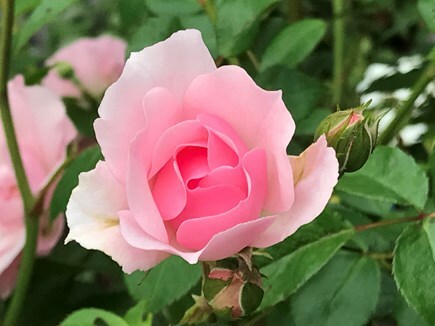 A perfect rose for a perfect vacation! Beautiful Boat Meadow Beach on Cape Cod Bay just 1/2 mile away! Dine at one of the many restaurants nearby, or cook in. 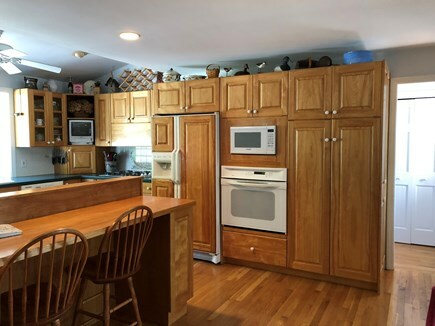 Between the gourmet kitchen and the outdoor grill connected to the gas in the house (no lugging propane tanks), you can whip up any meal you want! Cut fresh herbs from the kitchen garden or pick raspberries (in season) from the abundant bushes in the back yard. 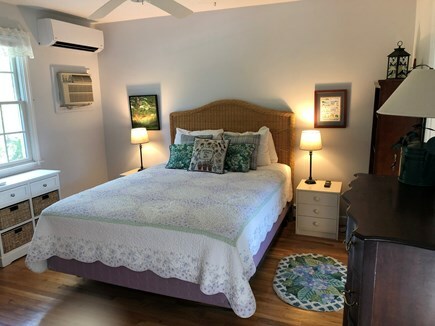 Three queen-bedded bedrooms, all with private baths (and a whirlpool tub in the master suite), give everyone a great night's sleep! 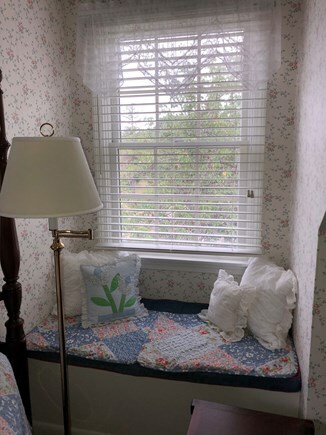 In 2 of the bedrooms, you can curl up in a window seat with a good book you just found in one of the well stocked bookcases. Need more? This clean, clean, clean Cape home has all you've dreamed of! 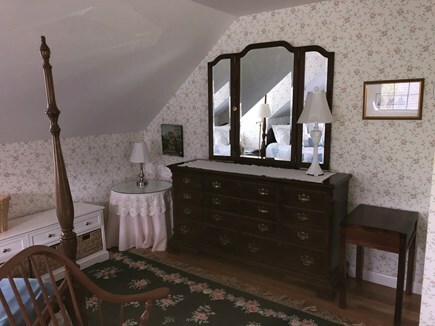 Beautifully furnished, including antiques. 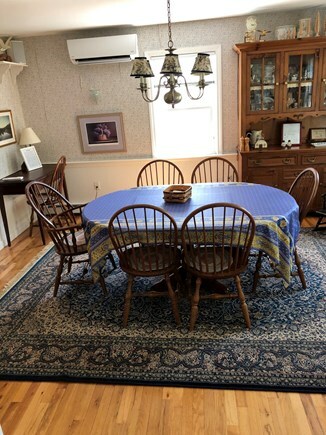 Formal dining room or casual dining on deck. 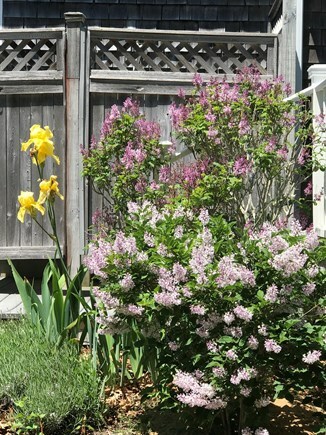 Private fenced yard next to conservation land insures quiet, even in summer! Half mile to nearest beach (Boat Meadow Beach). 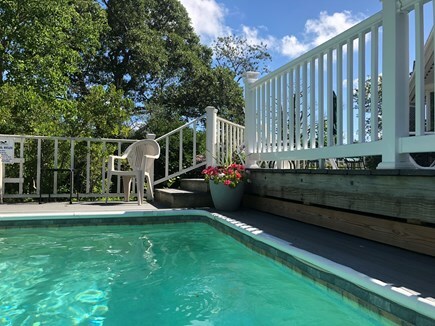 Heated inground plunge pool built into deck, whirlpool tub in master bath with separate shower, private hot and cold outside shower, linens available for additional $15/person charge, 5 cable TV's, 4 VCRs, CD & DVD players, plus more... This is a Saturday to Saturday rental. First floor bedroom, 1 1/2 bathrooms on first floor; 2 to 3 steps into house. 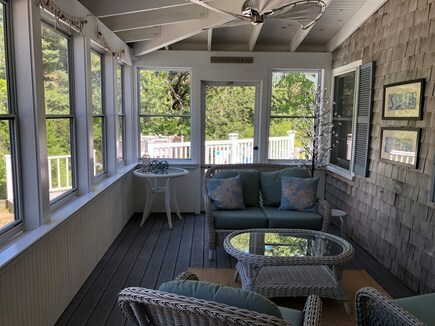 Beautiful home in Eastham! 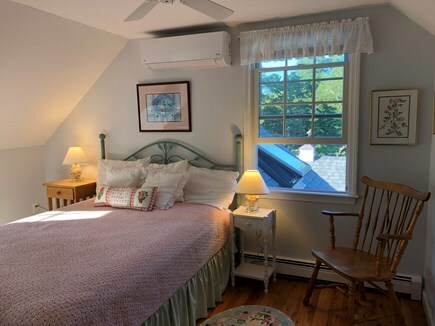 Great location and just perfect for a Cape Cod vacation spot! We had a wonderful week in this beautiful home. The home was large and clean with so many nice touches. 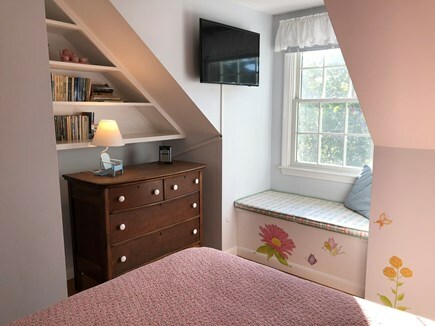 The two bedrooms upstairs were beautiful each with a private full bath. The kitchen was large and had every thing that you would need and more to use and cook with! 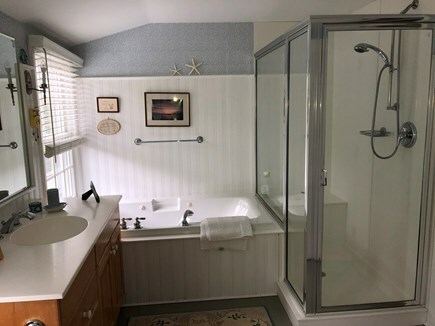 There was also another bedroom downstairs with a private bath and a half bath off the kitchen. The large deck was beautiful and my daughters enjoyed the plunge pool. The outdoor shower was very nice as well. The yard was very private with the house being at the end of a dead end street. It was a walk to a small beach down the street where you could see the most beautiful sunsets! 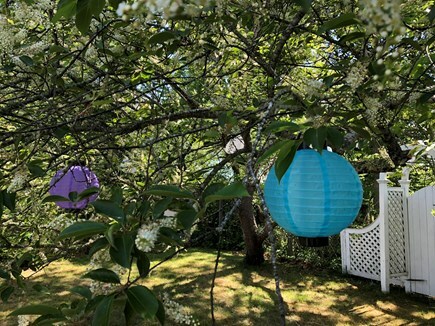 The location was great, being close to Orleans and all of the restaurants on Route 6 in Eastham and Wellfleet. The owner was so nice and the home was very well cared for. After a very bad thunderstorm and power outage in the area, we were all set with there being a generator.at the property. We went to a different beach everyday, Coast Guard, Nauset Light, Race Point in P-Town and even Craigville Beach in Centerville. It was a great central location for all of these beaches!! Thank you for sharing your lovely home -- it has such a happy, peaceful spirit. Our family has made many lifelong memories here -- we will not forget our two weeks of living joyously. The house has everything one might need and more. Your home is wonderful! It was perfect for our family vacation. We loved the very well equipped kitchen, the quiet yard, the pool, the close walk to the beach, and the list goes on! I'm so glad I found you! We thoroughly enjoyed our stay here and we're finding it very hard to leave! 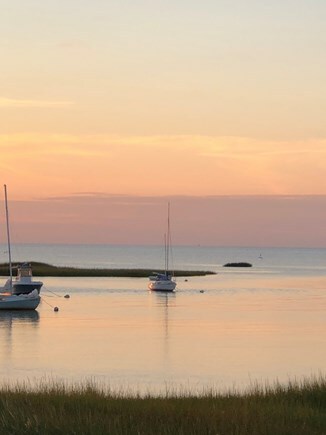 We stay in Eastham every year, and absolutely love this location! It was so hot this week, we spent most of the time out on the deck relaxing in the pool. Also had a great time walking around the neighborhood and looking for bunnies! Can't wait to be on vacation next year! Thank you for letting us stay in your wonderful home! It is our favorite (of 15 years!). The kids loved the pool and we loved the recliners. Take care until next year! I was 8 years old when I first set foot on Cape Cod. 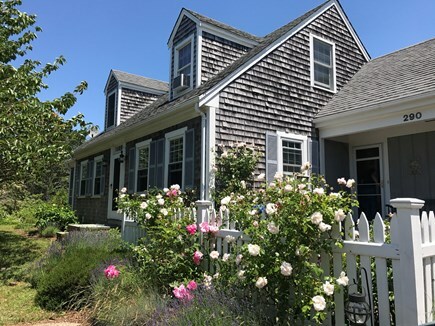 After my third trip (at 10) to Eastham, on the way home I announced to my parents that I was going to live on Cape Cod someday. It took about 38 years, but I have now lived here year round for 22 years. And never regretted a day. I grew up in Connecticut, went to university and graduate school in Connecticut, New York, and Massachusetts. I've worked in Boston, New York City, Philadelphia, Washington (DC), and Hartford. 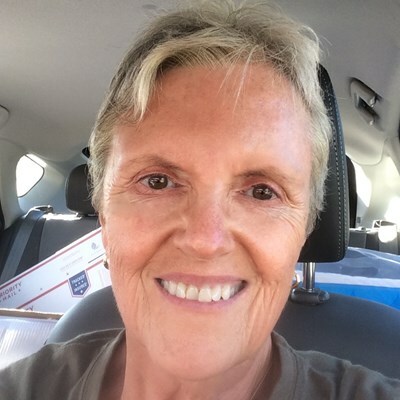 I've also worked In Hyannis (and Cape-wide) and in tiny villages in rural Pennsylvania, and I've worked on the internet in my own retail business. Most of my career has been working with non-profit institutions. 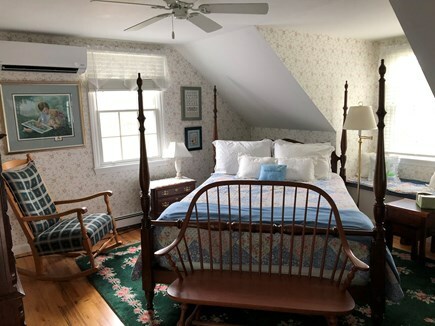 When I first moved to Eastham, after losing my spouse, I decided to open my home as a small Bed and Breakfast. I love to entertain and to cook and to make special treats...it was a match made in heaven! I did, however, have a lot of work and non-work commitments and running even a small B&B is time consuming. At the urging of friends I decided to rent my house in the summer months to families who might just fall in love with this little part of the world as I did! It's now nearly 20 years later, and I have met some wonderful people. After all my family rented a place to stay every summer for a long time...why not continue to do the same for others? First of all, I love my home! I love living here, and I love sharing it with others. I believe its greatest asset is its location. 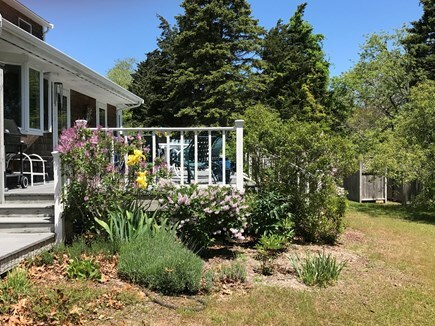 It is so quiet and peaceful, but still in a neighborhood with other folks nearby, and it is just a few minutes to the beach or into town or to get onto US Route 6 (Mid-Cape Highway) to go anywhere one might need! The house was built in 1970 and had been well cared for when we bought it in 1994. Before I moved in year round, I made extensive renovations to make it truly mine. I knew I wanted a large kitchen, a big wraparound deck, a small but deep pool, and tons of smaller changes! 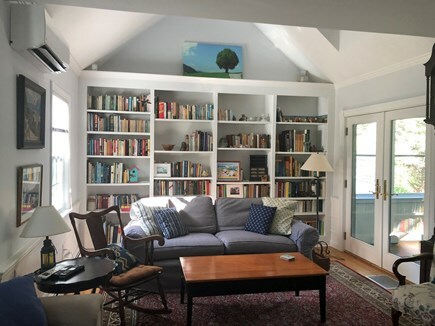 Over time I have added a screened porch, a kitchen garden with a picket fence, a bookcase wall in the living room, a cute little shed, a whole house generator (power outages in February are not fun! ), and solar panels. I must also mention that for families staying here (even when it's my own family! 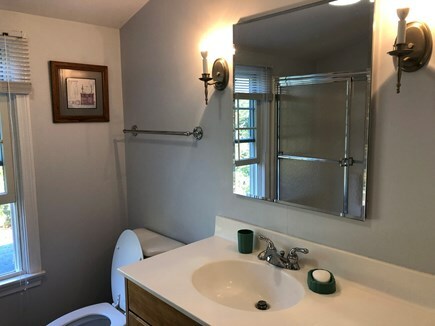 ), being able to give everyone a private bathroom is a huge asset! And connecting my barbecue grill to the gas in the house means not having to deal with propane tanks! Far and away the best assets that Eastham has are its beaches! This is where the National Seashore begins, with oceanside access easily available. We also have so many bayside beaches on beautiful Cape Cod Bay, each one somewhat different. And then, here on the Outer Cape, there are all those ''kettle'' ponds (depressions in the glacier formed outwash plains going back 18,000 years, give or take). 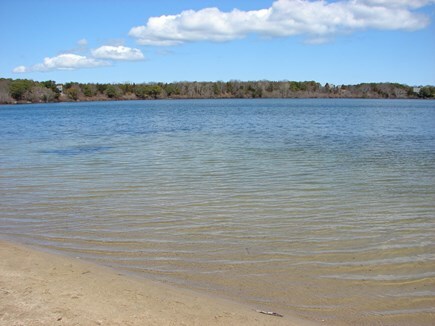 The water in these kettle ponds and lakes is clear and refreshing, a great place to stop and rinse off salt and sand from a day at a different beach. We have lots of human-made assets as well, either here in town or very nearby...great restaurants, interesting shopping, historic sites, boating, kayaking, biking. All in all, it's a great place to be!